HostGenius now offering web hosting and domain package deals just in time for 2015. "I found their services excellent in every aspect like price, performance, and software, uptime and customer support." Domain seller and Hosting provider, HostGenius (http://www.hostgenius.net) announces their domain hosting/registration package service just in time for 2015. The web host offers affordable plans, 99.9% uptime, and simplicity as well as VPS and server hosting. HostGenius offers hosting across all popular web platforms – from Windows to Linux. They offer Virtual Private Servers (VPS), dedicated or managed servers, business email and even offer Sitelock and SSL for security. Pioneers of the Globally distributed Datacenter concept, HostGenius has a globally distributed collection of redundant server infrastructure which hosts all of their Products and Services. As a result, this global infrastructure offers HostGenius customers a completely private-label global experience without any investments. HostGenius sells domains and often runs promotions where customers can take their dollar further. Additionally, they have the ability to sell domains in bulk or transfer them in bulk. And unlike other Web hosts and domain providers there are no restrictions on the number of domains that can be registered through this promotion. 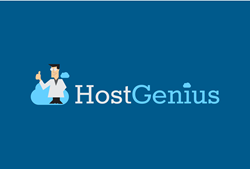 Lastly, HostGenius offer customers a hosting reseller affiliate program. With this program, resellers can make money by offering shared hosting to their customers. Resellers are offered a 30 day money back guarantee on all hosting services and one-click open source software deployment with over 250 library scripts offered. For more information, visit http://www.hostgenius.net.